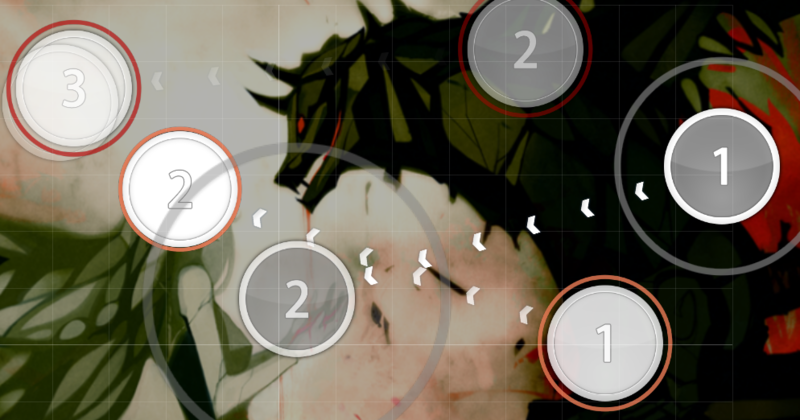 MY FIRST STORY - Saishuukai STORY [Osu|CatchTheBeat|Taiko] · forums · community | osu! I might also remap my diff. Not sure. I'll let you know if I'm going to do that. Hi there! Got asked to mod by Mikasa, so here I am. I am noob modder, so take everything with a grain of salt. I feel like this difficulty has some structural problems when comparing the intro and the kiai. The kiai is rhythmically much less dense than the first ~30s of the map, and also has lower spacing. While there certainly is room for interpretation when it comes to intensity, I do feel like your representation of the music in the kiai is a bit lacking. I think a 1/2 slider + circle, or even 3 circles would fit the music much better for those cases. 1/1 Sliders that skip over percussion also occur here 00:38:544 (1) - 00:40:777 (1) - 00:41:893 (1) . It might be more interesting to use slider repeats to emphasize the drums in this section. 00:29:614 (1,2,3) - I think a 1/2 slider + circle would be more consistent in this section. 01:19:846 (1) - I would personally put a circle on the slider-end here, so all the drum sounds ( 01:20:544 (2,3,4) ) have the same emphasis. As for spacing, it's mostly very noticeable that the intro has some very large jumps ( 00:10:218 (4,5,6) - 00:12:730 (5,1) - 00:17:614 (3,4) - 00:18:730 (2,3,4,5) - 00:26:265 (1,2,1,2,1,2,1,2,1) - ) which aren't really present in the kiai. It might be better to lower the spacing in the intro a bit. You could also increase spacing in the kiai. 00:44:544 (2,3,4,5,6) - The jump from 2 to 3 seems to imply that it is much more intense than the rest of the pattern, while there doesn't seem to be any real difference in the sounds. I suggest using more equal spacing to emphasize the sounds equally. 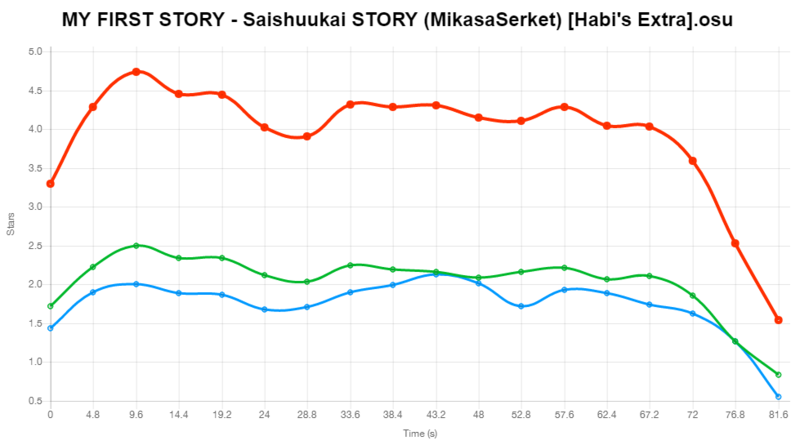 The difference in spacing and rhythm combined make the difficulty graph of this difficulty look like this, which shows the extent of difference in intensity when putting the intro and kiai next to eachother. Again, while not wrong, I feel like the gap in intensity could be smaller by making changes that in my opinion represent the kiai in a better fashion. Definitely a nice map in any case, good luck! Overall, this seems to be a pretty good map from my perspective. I only really have some issues with a few rhythm choices, but more importantly with your usage of certain hitsounds. 00:27:381 (1) - I feel like this slider, and the following ones, don't need any strong hitsounds. Soft hitsounding should be plenty to represent the calmness of this section. 00:36:311 (1) - From here on out I feel like you use too many drum-claps overall. They give a different, more intense, impression of the song to me. I think just using the normal sampleset without additions would fit the percussion just fine. 00:45:242 (1) - I would put a normal finish here, to be more consistent with other finishes in the section. I only really see rhythmical issues in places where a long slider skips over percussion 01:04:218 (1) - 01:05:195 (1) - 01:13:149 (1) . A better option here would be to have the sliders end on the percussion, and to place a circle where the slider-ends are now. 01:11:753 - Here you don't put anything at all on a strong drum sound. I suggest putting a circle here, instead of leaving this 1/1 gap. Pretty nice diff, just a few things to clean up in my opinion. 00:15:242 (1,2,3,4,5) - - This rhythm is pretty odd, you map a triple on 1,2,3 without there being a sound on 2. Then you map 4,5 as 1/2 circles even though there is a sound on the blue tick in between them. I feel like removing 2 and adding an extra note on the mentioned blue tick would be a much better rhythm. The same applies here 00:24:172 (4,5,6,7,8) . 00:20:963 (1,2,1,2,1,2,1) - This pattern closely resembles a pentagon, so I'd suggest making a perfect one for the sake of my OCD. 00:37:986 (2,3,4,5) - 4 consecutive 1/2 circles might be a bit dense in comparison with the rest of this section. Maybe it would be better to replace 2 circles with a 1/2 slider instead? 01:10:916 (1) - There is a drum sound on the red tick that you miss here. I think it would be better to change this rhythm into a circle + 1/2 slider. 01:20:404 - I don't really understand why you leave a gap over so many sounds. Mapping the vocals or drums should work pretty well in my opinion. 01:24:032 (3) - I think you forgot to hitsound a finish here. Cool diff! I feel like there are a few things that could be improved. 00:08:823 - Why not start the map here like all other difficulties? I don't really see a reason to only start at 00:09:381 (1) . 00:21:521 (6,7,1) - I think it would be better if the spacing were more similar to 00:20:963 (2,3,4,5) , as they are equally intense in the music. 00:47:195 - This vocal seems strong and deserves a clickable object in my opinion, just like you did here 01:03:939 (5) - . 01:04:218 (1) - There is a sound on the red tick, but it's covered by the sliderbody. I think it would be better if you changed this to a 1/2 slider + circle. 01:10:079 (2,3) - I feel like blanketing 2 over 3 would be more visually consistent with other patterns in this section. Same goes for this pattern 01:13:428 (3,4) . 01:23:056 (7) - There is no strong sound here, so it would rhythmically be more correct to either have a sliderend or nothing. 00:13:846 (1) - I feel like a finish would fit better here than on 00:14:544 (3) , just like you did here 00:22:777 (1,2,3) . 00:37:149 (6) - I think you accidentally put the sampleset to drum here. Same here 01:15:381 (1) . 01:23:195 (1,2,3) - 3 should definitely have a finish, it could also fit on the slider-heads of 1 and 2. Not much to say here, nice job. 00:16:497 (2,3,1,2,1,2) - this pattern seems a bit disorganised. I think it could be improved by aligning the notes more like this . 00:17:474 (2,3) - I feel like you should hitsound claps here, to be more consistent with patterns like this one 00:22:358 (1,2,3) . 00:27:381 - I'm not sure why you put a break here, in comparison with all other difficulties. I think it would improve the structure of the map and set if you mapped this section as well. Woo, jumpy top diff. Pretty good overall in my opinion. 00:35:614 (2,3,4,5,6,1) - Even though it's a jumpy diff, I feel like these in particular are a bit overdone. This section is much calmer than the kiai and intro, yet this pattern has similar spacing to those sections. I suggest lowering the spacing to fit the song better. 01:01:149 (1,2,1,2,1,2,1,2,1,2) - this pattern seems a bit lazy to me, in comparison to others in the map. I think its aesthetics could be improved by giving it some symmetry instead of just copy-pasting? 01:06:451 (1) - There is a strong sound on the red tick, but the sliderbody covers it. It might be better to use a rhythm that at least puts some form of emphasis on the red tick. Also, your difficulty seems to lack hitsounding, so I suggest you add those as well. Cool song, cool set, good luck! 3 game modes and no mania. Ok.